A brief history of the Faculty of Architecture, Building and Planning and the Melbourne School of Design at the University of Melbourne. 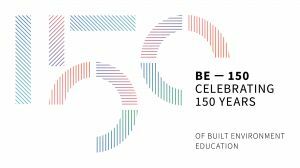 In 2019 the Faculty of Architecture, Building and Planning celebrates 150 years of built environment education at the University of Melbourne. The BE—150 program provides a myriad of opportunities for meaningful interactions, discourse and new connections within our community. The program offers an opportunity to celebrate the impact our community has made. It provides possibilities to showcase the talent of our students, alumni and staff and is a chance to explore the contribution they are currently making and will continue to make in shaping the future of built environments professions and forms both locally and globally. The timeline below provides a brief overview of key milestones in built environment education at the University. The University establishes the Engineering Certificate course (taught through the School of Engineering) including an architecture subject. Teaching of the Engineering Certificate commences, and it is regarded as suitable for training architects. Anketell Matthew Henderson (1853-1922) enrols in the Engineering Certificate. Henderson takes architecture subjects while completing articles concurrently with the Melbourne based architecture firm Reed & Barnes (which continues today as Bates Smart). He completes the program in in 1872, only the fifth candidate to graduate from the program. Henderson goes on to become a significant figure in Australian architecture, engineering and surveying, both as a practitioner and educator. He is considered the first graduate to have joind the University with the specific and expressed intent to practice within a built environment field. This year, 2019, marks 150 years since that enrolment. Following Professor Pearson's recommendation for the establishment of a chair in Engineering and a Lecturer in Architecture in 1877, Anketell Henderson appointed as first (part-time) lecturer in Architecture. Within Engineering, Architecture was taught as a science. However, Anketell Henderson and his successor Rodney Alsop, both stressed its aesthetic aspects. In 1919, Alsop succeeded in establishing an Architectural Design Atelier, formally known as the Melbourne University Architectural Atelier (MUAA). It was open to holders of the architecture diploma or those who met work-experience criteria, and it offered a three-year Postgraduate Diploma of Architectural Design. Teaching for the Diploma continued in the overcrowded Engineering building until 1923, when separate accommodation for architecture was allocated in the new Anatomy building, today the Richard Berry Building. After World War II, Architecture occupied a series of army huts located outside the Engineering building and near Grattan Street until 1968. Eileen Good is the first woman to graduate with the Diploma of Architecture. Eileen goes on to become the first full-time member of academic staff in School of Architecture in 1924, making her the first woman to teach in an architecture school in Australia. J G Gawler is appointed (part-time) Lecturer in Architecture, and a hut is provided to accommodate the School of Architecture (as distinct from the Atelier). 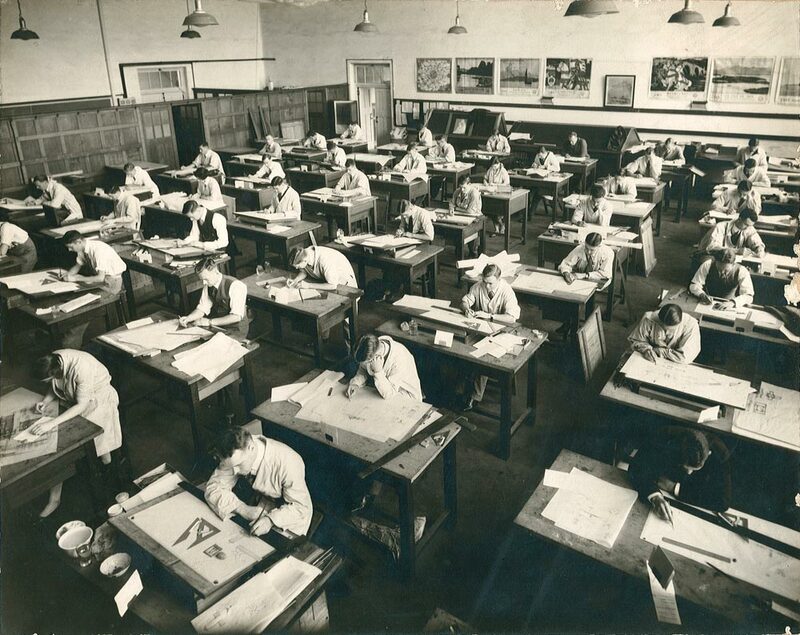 In 1927 a Bachelor’s degree course in Architecture is established, including Town Planning. The following year, a Diploma of Architectural Design is introduced for Atelier students. Faculty status for Architecture was attained in 1931 and the first bachelor’s degrees were conferred. Brian Lewis was appointed to a Chair in Architecture in 1947 and revolutionised the course by introducing leading European ideas, with an emphasis on design. A Department of Town and Regional Planning was established in the 1951, affiliated with the Faculty of Architecture, but with its own Board of Studies. Its energetic first director, F. W. Ledgar, managed to attract significant numbers of students to a postgraduate course, and a degree was later introduced. In 1958, a Bachelor of Building was established. Architecture obtained its own building in 1964, and it was wrought through compromise. Severe funding constraints led to an inadequate grant being offered for construction and Lewis acquired materials as donations from the construction industry. 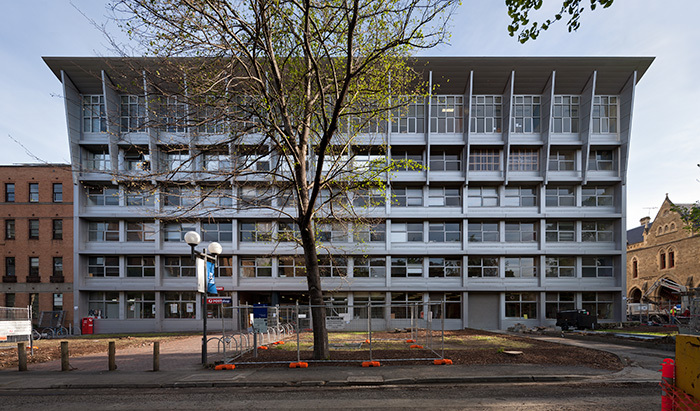 While functional, the building fabric was compromised and by the early 21st Century, enrolments of over 1,200 students had exhausted its studio space. The building is officially opened by HRH Prince Philip, the Duke of Edinburgh. The historic Japanese Room (designed by Shigera Yura) is part of this new building. Course offerings continue to grow, with the establishment of a Master of Building and a Master of Building Science. In 1970, Leo Simon is appointed to Foundation Chair in Building, the first such Chair in Australia Fred. F. W. Ledgar becomes Victoria’s first Professor of Town and Regional Planning. The following year, Brian Lewis retires. In 1972, Fred Ledgar is appointed as Dean and Charles Robertson is appointed Professor of Architecture. In 1975 a new Faculty of Architecture, Building and Town and Regional Planning is established. The following year, a Master of Environmental Studies and a Master of Landscape Architecture is established (taught by the Centre for Environmental Studies). The Master of Urban Planning is also introduced. In 1978, a Master of Landscape Architecture is introduced. The following year, Professor Alan Rodger is appointed Dean. In 1980, Professor John Scrivener is appointed Dean and Graham Brawn is appointed Professor of Architecture. The Academic Board initiates an inquiry into the viability of the Centre for Environmental Studies and the Department of Town and Regional Planning resulting in a recommendation that the two bodies and their courses are merged. The inquiry also recommends the introduction of the Bachelor of Planning and Design. In 1982, the Faculty of Architecture and Planning is established, consisting of Department of Architecture and Building and School of Environmental Planning (SEP). George Seddon is appointed Dean and David Evans is appointed the head of SEP.
Another University inquiry into the Faculty recommends the amalgamation of departments to form a single department faculty from 1 January 1995. Ross King is appointed Dean. In 1993, Haig Beck appointed Professor of Architecture. In 1996, Jon Robinson is appointed Professor of Building. The following year, Ruth Fincher is appointed Professor of Urban Planning Property. A fifth floor is added to Architecture and Planning building and the building is recladded. In 1999, Catherin Bull is appointed the Elizabeth Murdoch Professor of Landscape Architecture and the Bachelor of Urban Planning and Development is established. Lewis’s basic course structure for Architecture endured for nearly five decades. Under the Melbourne Model, (a revision of the University’s curriculum) the undergraduate course was incorporated into a Bachelor of Environments, offering a range of majors taught by the Faculty, but now combined with majors from Engineering, Science and the School of Land and Environment. This new degree now leads to a range of postgraduate courses taught through the Faculty’s Melbourne School of Design (MSD), including architecture, construction management, landscape architecture, property, urban planning and urban design, all of which provide professional accreditation and position the university centrally within the built and natural environments as a gateway to practice. The 1968 building was demolished at the end of 2012 to accommodate a new building on the same site. The Faculty’s new home is a purpose-built, studio-focused facility for contemporary courses in Architecture, Building and Planning - an outcome of an open call for expressions of interest from architectural firms worldwide. 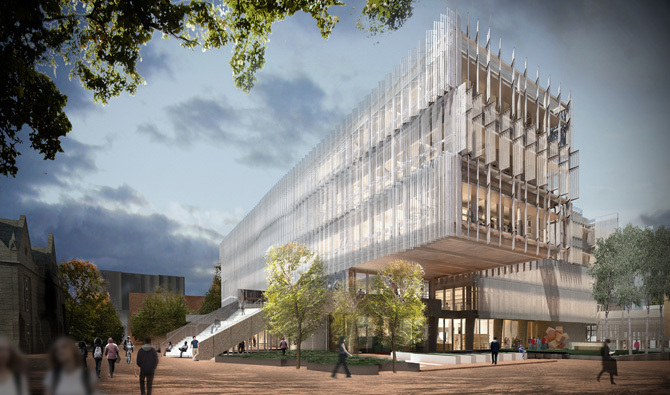 Melbourne’s John Wardle Architects and Boston firm NADAAA combined their expertise to deliver the winning design. The building was completed on October 1, 2014. The Japanese Room and the Joseph Reed façade, key features from the previous building, are incorporated into the new building. Launched in 2017 the program focuses on design studios, site visits, innovative and creative problem solving, field trips and interaction with industry practitioners. Combining humanities, sciences and visual and performing arts within a single degree, the Bachelor of Design aims to develop expert knowledge and skills within the built environment, engineering, technology and performing and visual arts disciplines.